Soldiers have removed body parts from corpses to keep as trophies as souvenirs of war since ancient times. According to Katy Meyers Emery, mortuary archaeologist and bioarchaeologist, human remains as souvenirs of war can be divided into two categories, trophies of dominance and trophies of veneration. A trophy of dominance is taken from the body of an adversary and is meant to dehumanize the enemy and demonstrate the taker’s skill in battle. A trophy of veneration is a kind of relic that is treated with reverence. 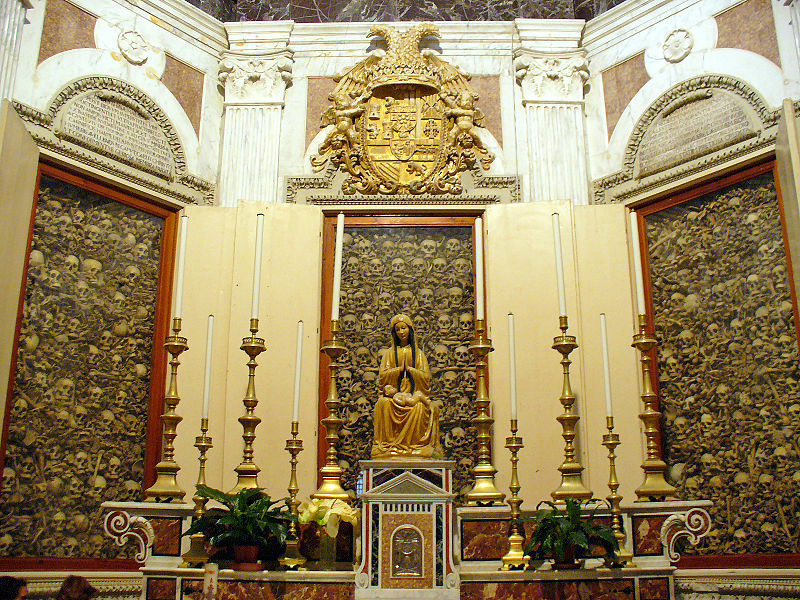 These include bones from saints or famous historic figures that are often displayed in reliquaries. Archaeologists have found trophies of dominance that date back to ancient Egypt, ancient Mesoamerica, and ancient Londinium. Archaeologists uncovered 16 severed hands buried in four pits under a palace used by a Hyksos king in ancient Egypt. Researchers have also documented the practice of taking human body parts as souvenirs throughout Mesoamericanby the Mayans and the Aztecs. Recently archaeologists published their findings on 39 skulls recovered from a pit that date back to ancient Londinium, or present day London. The evidence they found indicates that many of these skulls belong to men who died violently and their heads were severed and displayed in open pits. Over the centuries soldiers have become more resourceful about memorializing the remains of their enemy. There is a newspaper account, published in 1880, of an unverified story about a French general’s skeleton that was used to make a set of china. After the Battle of Waterloo, an English soldier was rewarded for his bravery with anything from the battlefield. He chose the skeleton of a French general, which he took home to England and stored it in a closet. When his souvenir became clutter, the soldier gave the skeleton to a manufacturer of china who turned it into a tea set. According to the newspaper article, the tea set was part of the collection at the museum of Hanley and inscribed with its provenience. Trophies of veneration taken from the battlefield are also fairly common. Examples of these souvenirs include the 800 Martyrs of Otranto, the Ossuary of Custoza, Italy, and a brooch made from a soldier’s leg gifted to his bride-to-be. Antonio Primaldo and his 800 companion martyrs were executed on a hill outside of the Italian town of Otranto by Ottoman Turk invaders in 1480 when they refused to convert to Islam. The surviving townspeople took the remains of the 800 Martyrs to the local cathedral and placed them in a giant reliquary behind the altar as a reminder of their sacrifice. The “800 Martyrs” were beatified in 1771 and canonized by Pope Francis in 2013. In 1848 and 1866 the Italians fought two battles at Custoza, in northern Italy, as part of their struggle for independence against the Austrian Empire. An ossuary was built in 1879 on Monte Belvedere, the highest spot in Custoza, to honor the thousands of soldiers who lost their lives and to venerate their remains. It reportedly houses the skulls and long bones of more than 4,000 Italian and Austrian soldiers. 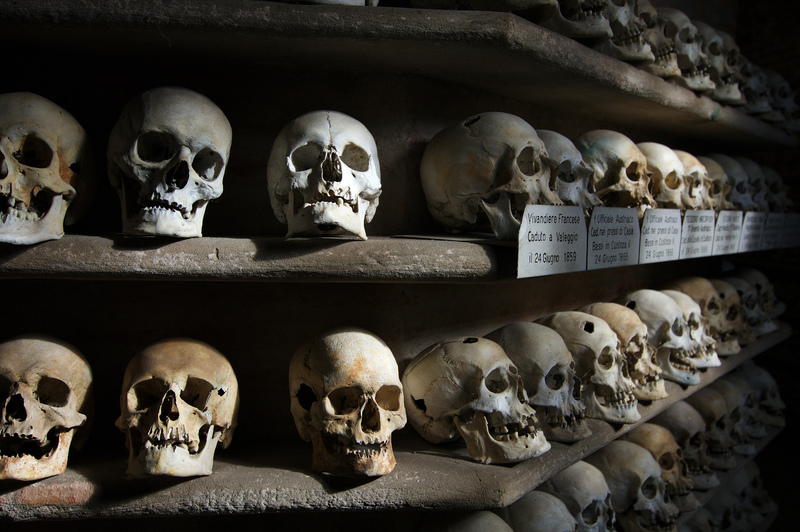 The skulls are displayed on six shelves that line the walls of the ossuary, the long bones are stacked neatly in piles at the center, and there are shrines for the remains of the commanders. Sergeant Thomas Kitching’s fought with the 12th Battalion, Durham Light Infantry in World War I. His leg was shattered at the Battle of Somme on July 7th 1916. Rather than letting the entire appendage become medical waste, he had a piece of his femur removed and crafted it into a brooch for his bride-to-be, Lizzie, at home. Kitching survived his wound and married Lizzie. The brooch is part of the Liddle Collection at the University of Leeds in England. A special thanks to @GillHoffs for the tip on the “Ghastly relics of Waterloo” newspaper article. Larson, F. (2014 November 11). Severed: A history of heads lost and heads found. New York, NY: Liveright Publishing Corporation.